Jammin’ On The Ones … And Twos? There are a number of extra-curricular activities available to teens from sports teams to learning how to play the piano. If you're tired of the typical after-school activity, learning how to deejay can now be an option. Learning how to work the turntable can now be taught just as any other instrument with the opening of Scratch Lab, a DJ institute that teaches people the art of deejaying by some of Canada's top DJs. Classes offered at Scratch Lab are perfect for those who are interested in deejaying as a hobby and for those who are interested in deejaying as a profession. Scratch Lab offers beginner and advanced classes, which are offered in semesters that run for 12 weeks with 10 classes. Classes run during the week on afternoons and evening and during the daytime on weekends. The beginner classes allow students to get the theory in the lecture part of the class and the hands-on experience of deejaying in a studio setting in the lab component of the class. This class is taught by urban and club DJ Baba Kahn, party DJ Starting From Scratch, Hip Hop and R&B DJ Baby Yu, Soca and Reggae DJ Dr. Jay, DJ Jed-I, Jr. Flo and DJ Grouch. The intermediate class is for students who have some DJ experience where they learn equipment set up, basic mixing and basic music theory. The advanced class is for working deejays where they can further their skills. "The advanced class is a fun-play more creative, show process of it," said Baba Kahn in a phone interview. 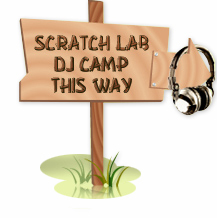 Some specialty classes offered at Scratch Lab include Sampling, Music Production, Music History and Business of Djing. Scratch Lab opened in December by Jordan Fisher who is the Director of Marketing of Scratch Lab and Abby Tobias who is the President. After researching if the idea existed in Canada, they decided to start the deejay institute. There was something still lacking. "We were still missing a piece of the puzzle," said Fisher in a phone interview. "Baba was that piece." Baba Kahn is the Director of Operations of Scratch Lab. There were some challenges in opening Scratch Lab. "There was no formal business model to follow and no formula to follow," said Fisher. "It was a unique idea and business idea that did not come to form yet so we had to invent that to a large extent." According to Fisher, Scratch Lab is a unique extra-curricular activity for teens. "It's a unique concept and a great outlet for teens," said Fisher. "It can incorporate your musical talents." In addition to offering classes, Scratch Lab holds a year-end showcase where students are given the opportunity to showcase their talents in the attendance of clubs, business owners, promoters, DJs, and talent agencies. This is beneficial for those who are interested in pursuing deejaying as a career and for those who want to show off their new skills. "It's a system to feed them into jobs," said Fisher. Since Kahn did not have the advantage of learning deejaying from an institute, he taught himself by attending nightclubs and learnt the craft from other DJs. "You get rid of old habits as you go on," said Kahn. "There is a correct way to do it and you learn from other DJs. You learn by trial and error and you learn as you go on. You can always get more focused." There are many benefits for teens in taking a class at Scratch Lab. "They are learning a true art form," said Kahn. "They realize it takes time and takes dedication. Learning just a new profession takes a lot of confidence. It also helps you to coordinate yourself." Learning to deejay is an ongoing process. "You are good as your last club event," said Kahn. That's always your motivation." Future goals for Scratch Lab include opening institutes nation-wide in Canada. "We're making a very strong foundation," said Kahn. The next semester of classes starts in April. People can register over the phone at 416-Scratch or they can download a registration form at www.scratchlab.ca. Tours of the facility are also available. Dance workshops are a unique extra-curricular activity for teens. Be Discovered, an entertainment booking service in Toronto that places new faces to work on film, TV, videos, commercials, stage and print work, offers dance workshops with top choreographers. This is different from the typical dance classes offered at dance studios and schools, as people are able to work with the top industry professionals. Be Discovered workshops are perfect for those who are interested in dance as a hobby and can also be training for those who are serious in pursuing a career in dance. "Be Discovered started in order to provide an avenue for new faces and talent to be seen by industry decision makers," said Diana Uribe who is the Talent Director of Be Discovered. "When I was a teenager I had dreams of being a star and didn't have too many options on getting into the industry. I wanted to provide these opportunities to youth that I didn't have myself." Some of Be Discovered's accomplishments include placing dancers and extras in films such as Honey and Mean Girls. Talent has also been placed in music videos for artists including B2K, Sean Paul, Shawn Desman, Aaron Carter and Alanis Morisette. Upcoming workshops include Summer in LA, which is offered to teens every summer. This takes place in late July and is a week long. Teens get the opportunity to train at LA's top dance studios and take unlimited dance classes with the industry's top choreographers including Shane Sparks, who was the choreographer for the movie, "You Got Served" and the television show, "So You Think You Can Dance." "No other programs of this kind exist here in Canada so this is very unique," said Uribe. "Another great thing about our summer in LA dance experience is that teens get to make friendships that will last a lifetime with other teens who share their same love for dance." Other upcoming workshops being introduced later this year are the Orientarhythm workshops, which is a dance style from Japan that incorporates street style dance and martial arts. Workshops will also be taught in locking, whacking and nunchukas. According to Uribe, this will be the latest dance craze in Toronto. Be Discovered's workshops can benefit teens in many ways. Go to any party and one of the most popular people there is bound to be the disc jockey - they spin the tunes and keep the party going. Now, you can learn how to be a disc jockey and possibly earn a living once you've completed the certificate course. The Scratch Lab DJ Institute, Canada's first disc jockey school, opened its doors in January by Baba Kahn, Abby Tobias and Jordan Fisher, three Toronto area entrepreneurs who know how to spin a tune. During the 10-week course, instructors teach students how to become a professional DJ in a very competitive market. "The environment is personable and our instructors are at the top of their game, including "Starting From Scratch" who is heard daily on FLOW 93.5, and enjoys mixing it up with the students,' say Jordan Fisher, owner and director. Classes range from beginner, for those new to the world of scratching, to advanced where veteren DJ's can improve their craft. Each level is designed so that students can stream easily from one semester to the next. Other courses include Scratch Tricks, with DJ Grouch, who teaches the different styles of scratching in an advanced class as well as Mobile DJ, that covers the basic set up and tear down of the equipment. Students can also use their private studio to create their own mixed tapes, as well as learn the best way to showcase new artists and how to legally sample existing artists. Instructors will also help students get a little exposure. "Our instructors will help you land a club gig, as well as get your name out there," says Fisher, adding students can also job shadow at a club fi they're over 19 while still taking classes. Ryan Pinto, 32, father of two, gets one night out a week. Instead of poker with the boys or a game at the ACC, he does something truly extreme. Like thousands of other Torontonians, Pinto is enrolled in one of the city's growing number of adult education programs that range from criminology studies to cartooning. At U of T, York and Ryerson Universities alone, an estimated 50,000 students are enrolled in continuing, adult education or non-degree studies. And while the phrase "back to school" can ring like a rude wake-up call, adults currently venturing into classrooms as a new term begins say lessons signal opportunity and betterment. Even fun. "I was actually looking forward to being back," says David Shadoff after his first Japanese lesson of the new year. "I knew it was going to be a bit of a rusty period for me, but everybody in the class was going to be a bit rusty, and that was comforting." Shadoff, 38, spends his Saturday mornings at the Toronto Japanese Language School. He says he hopes to one day be able to pick up on the finer points of Japanese literature, but for now, the classroom vibe keeps him content. "I like learning. Maybe I'm a little different than most people that way. I did well at school but I tended not to actually learn from the teachers. I just knew some things, figured out much for myself and could remember things very quickly. But as I'm getting older, it's getting harder for that to just automatically happen, especially with something as obscure and different as the Japanese language." Once dedicated to kids' classes, the school now has about 200 adults enrolled. Registrar Gary Cunning says their reasons are "as varied as the number of students." Some, he notes, want to decipher Japanese comics and cartoons, while others want to maintain a language they've already learned "Part (of the reason) is social. I think for a lot of them it's the only chance they get to interact in a common way, where their problem isn't a person, like a boss." People are finding there are more things they want to learn about without the pressure of things like exams. They've heard from others or they've experienced it themselves that school isn't what it was when they were in it. There's much more freedom. Audrius Stundzia, 47, says he studies Japanese for business. His work, installing medical imaging software, takes him to Japan for four weeks in spring and six in autumn. With better Japanese, he says, he'll get more out of his time there. "When I was growing up, every Saturday morning I would get up and off I would go to Lithuanian school for three hours, so now it's a real sense of déjà vu to do it again," he says, standing at the end of a hallway decorated with pencil-crayon drawn posters and "No Bully Zone" signs. "I'm having flashbacks!" he laughs. Across town, violinists doing scales replace the chorus of Japanese phonetics. The locker-lined walls of what was once Ursula Franklin Academy are now home to The Royal Conservatory of Music Community School, where the spring semester begins next week. Dean Jeff Melanson says adults make up roughly a third of the student population. Registrar Lisa Griffiths says "They'll come into the office and say `I've always wanted to play the guitar, but it's too late to start, isn't it?' waiting for us to say, "Yes." "But it's absolutely never too late." Griffiths says the classes also offer a social network. "There's one class that goes out to the pub after every rehearsal and tries a new beer!" She says adult registration has risen as new programs have been created. Courses like Rock Band Jam, and Cover Tunes: Beatles & Bob Dylan, have proved popular with adults, as has the RCM's "From Scratch" series — lessons for absolute beginners in everything from tin whistle to taiko drums. Diane Abbey-Livingston, a change and development consultant, says aging baby boomers are turning to learning. "People are finding there are more things they want to learn about without the pressure of things like exams. "We're living in a curious society. Classes aren't about lectures and notes any more. They're fun. There's laughter," she said as she headed out to a Tai-Chi class. Time-crunched young father Pinto is a serious music lover with a CD collection in the hundreds to prove it. Seven weeks ago he began lessons at Scratch Lab DJ Institute, a north Toronto school that teaches turntable techniques like scratching and remixing. "Seriously, I have always wanted to do this, but there was no way to learn. Back in the day, I used to ask some of my DJ buddies `Can you teach me? Can you teach me?' and they'd show me a bit, but no one ever cared enough to carefully show the details," he says. "Now I'm 32, have two kids and had kind of lost sight of all that stuff. "But when I saw the ad for the school, I was like `Wow, here it is. This is it. This is exactly what I've been waiting for.'" Pinto now spends one evening a week learning to DJ. He says it's his first dip back into the education pool since graduating from university 10 years ago — a dip he took with hesitation. "I didn't know what to expect student-wise," he admits. "But the great thing about the school, and I'll be honest with you, is that there are people my age there. I thought there might just be kids." The fear of being the oldest in class is just one factor that makes adults hesitate. Griffiths, at the RCM, says first-day jitters hamper her would-be musicians. "For sure, adults are much more nervous learners than children," she says. "Children jump in. If you ask a child to go on stage and play something, they say `Okay, sure, whatever.'" But, she says, adult students return to their second class full of energy and an enthusiasm that's hard to extinguish. She speaks of one class, a recorder group, composed primarily of seniors. "I was talking to one of the students in that class today. He's 87 and he's one of the younger ones!" Money and time are the key challenges for continuing ed students at Humber Institute of Technology and Advanced Learning, says Janis Miller, Dean of Corporate and Continuing Education. "There's financial challenges for (adult students) because they're at that age where a lot of expenses are coming their way — mortgages, car loans — all the things we start to invest in once we move into the workforce and start to establish ourselves," she says. Of Humber's 54,000 annual registrations, Miller says 67 per cent of the students are between 25 and 44. Michelle Holtzkener, 32, manager of creative services at EMI Music Canada, knows that fitting classes into an already stacked schedule is stressful. Still, she describes herself as "addicted to courses," and says her extracurricular studies fall under "work courses," like Quark, Illustrator and Photoshop, to "stay on top of my field," and "hobby courses," like pottery, knitting and lamp-making, to "expand my horizons and try new things." Almost every term she tries to take one from each category. Somehow. "It's tricky," says admits, "but if you put it into your schedule and you plan for it weekly, it's amazing what you can rearrange to make things fit, especially if you want to get something out of it. I think that's the difference between going to school as part of the continuing education program and going because you have to: you're there because you want to be, and that's a different drive." "The key motivation for me," says adult student Surya Vyas, 53, "was definitely to learn more for the profession that I am working in and to make myself marketable." Vyas left his position at a bank in India and moved to Canada in 1999. He says once his family arrived and began working, he decided the time was right for him to go back to school. Last semester was his first at Humber and he's currently studying Intermediate Accounting. "This is a dynamic country and things keeps changing, so one must keep abreast of what is the latest," he says. "I still have a working life of at least 15 years, so if I put three years into study, I'll be better placed in 12 of those years." When asked if he plans to ditch his number-crunching courses for some hobby classes, he laughs. "I definitely hope I stay in good health and am capable of learning new things after I retire, because I would look forward to that." These links can help guide your creative quest back to the classroom. This non-profit organization eases adult students back into the system. Access to resources, community referrals, and peer tutorials are a few of the services it offers. Whether you're functionally fluent and looking to brush up, or your Japanese consists of nothing more than types of sushi, one of the school's eight levels is right for you. And no, "California Roll" isn't Japanese. Sure, dry courses like Accounting and Home Inspection are Humber's big draws, but they also offer classes in stand-up comedy, rock climbing, Latin American dancing and wine tasting. Not too cool for school now, are ya? Once you get past the daunting "Royal Conservatory" part, you find a relaxed place you can learn to bust out Brazilian samba rhythms and jam on Neil Young tunes. Admit it — ever since "Groove Is in the Heart," you've wanted to know how to ride the crossfade `til the break of dawn. Now's your chance. Starting Jan. 9, some of Toronto's best DJs, and some of its greenest wannabes, will together converge on a small industrial mall on Sheppard Avenue, across from Downsview Park. The Scratchlab DJ Institute is the country's first DJ training school, run by a guy who ''wants to turn the turntable into the guitar.'' Abby Tobias, a baby-faced 27-year-old in pinstriped Sean John shirt and black Kangol hat, is a hip-hop missionary who started DJing at 15. ''I'm one of those guys who believe that in 25 years Jay-Z will be Bob Dylan,'' Tobias says from behind his desk. ''DJing and the art of the turntable will one day be looked upon as a serious art form." 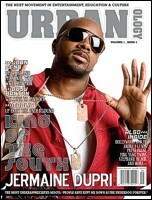 Canadian Urban Music Awards and a mainstay on Toronto's Flow 93.5 FM station. "Scratch is to a turntable, on a very unique scale, what Jimi Hendrix was to a guitar," Tobias says. "And most people don't recognize that. He's the best DJ in the country, if not the best DJ this country has ever seen." With Tobias on this venture is another Toronto club DJ legend, Baba Kahn, and businessman Jordan Fisher. For the past 15 years, Kahn -- known to his mother as Atul Babber -- has built a name for himself as Toronto's most celebrated club DJ, spending almost every weekend of his adult life playing to throngs of dancing revelers. He has worked with Destiny's Child and Busta Rhymes, and won the Canadian Urban Music Award for best DJ. He is the institute's director of operations. Scratchlab plans to train both club DJs -- who specialize in party hosting and mixing music for clubs -- as well as turntablists -- a name reserved for those DJs who specialize in the creation of music using turntables. Scratchlab also plans to offer courses in mix-tape production, music programming and ''the art of the mobile DJ,'' which will teach students how to get started as a professional. Tobias is above all a businessman -- his promotions company Sole Power productions is heavily involved in the Toronto entertainment industry -- and has seen the potential of such schools, as he watched the rise of the Scratch DJ Academies in the United States. The first was opened in New York City in 2002, when Jam Master Jay, DJ for the groundbreaking hip-hop act Run DMC, teamed up with Bring in Da Noise, Bring in Da Funk author Reg Gaines. Despite Jay's murder later that year, Scratch DJ Academy has expanded to include campuses in Miami and Los Angeles. At Scratchlab, students will be streamed into one of six classes appropriate to their skill levels. "This company is built not only for the kid who has never touched a turntable before, but also the guy who has been DJing for 10 years and now wants to learn from the best DJs in the country," Tobias said. Most of the calls he's receiving come from people who have little or no experience at a turntable. "We've had one call from a 35-year-old woman, and another from the mother of a nine-year-old boy, and they've both registered," Tobias said. 12 weeks and will run you $450. The institute supplies all the necessary gear, including a two-record set of music produced by Kahn, called The Curriculum. Dozens of students have already registered for the first semester. Tobias said he doesn't see most students walking out the door and taking up residencies at hip downtown nightclubs right away. "We're an after school, recreational program," he said. "We're not preaching to anybody to drop out of high school to become a DJ. But we want to show you that there is that possibility that this can be a profession, and here are some guys who have made a career out of DJing." It sounds like an aerobics class. "1, 2, 1, 2, 1, 2," chants the instructor from his headset and the students chant back slightly out of synch with each other. The difference: these students aren't doing alternate leg raises, they're trying to stay in tune as they mix together two tracks. The setting: Scratch Lab DJ Institute. The instructor: Baba Kahn, Canada's famed party DJ of over a decade. The students: five diligent, hard working individuals registered in Scratch Lab's Beginners One course. Located in northwest Toronto, the institute is nestled within a strip of warehouses; however, it's not a typical barren, dusty storage space. Instead it is decorated with vibrant yellows. The outside enterance resembles half a large vinyl record. Images of DJs, turntables and the Scratch Lab logo are splashed graffiti style on the walls of the classroom. Twelve sets of Numark turntables sit atop tables lined in neat rows, and one set of turntables sits raised on an instructor's platform, with a giant projection screen above. The two private lesson rooms are decorated with vinyl wallpaper and hanging throughout the entire office, including in the bathroom, are Justin Bua paintings. For aspiring and accomplished DJs alike, it's like being a kid in a candy store. Scratch Lab opened its doors in January 2006, approximately two years after long-time friends Jordan Fisher and Abby Tobias realized, while out for dinner one night, that Canada didn't have a DJ school. The two also determined they were going to fill this void. Fisher, who hails from a marketing and advertising background, and Tobias, who has a long standing career in the music entertainment and club promotions fileds, had two pieces of the pie covered. Still, there was something missing: they needed a third person, someone who had the DJ credibility and stature that would send students flocking to the school. After speaking with DJs across the country, Tobias approached Kahn to come on board with the school, as both an instructor and the third partner. Now, with the first semester in the school's history complete, the trio of entrepreneurs under 30 is more than impressed with the success of the school, and the talent of its students. "What I've found is that almost every student has surprised me in some way, shape or form," explains Kahn, one of three head instructors at the school. FLOW 93.5's Starting From Scratch and CKLN's DJ Grouch round out the instructor line-up. "There's a 13 year-old who on his first class of learning how to beat mix, beat mixed a track for a minute and that shocked me," continues Kahn. "Ten minutes later there was a 22 year-old, who after listening to another track, beat mixed in his first class of beat mixing and that was shocking. Two classes [later], my whole class was beat mixing." With a curriculum covering everything from DJ skills to remixing to the art of the mobile DJ, Scratch Lab is a one-stop shop to learning all aspects of both the art and the business of DJing. And for just under $500 an individual can enjoy a semester (consisting of 10, 70-minute classes and five practice sessions) for either career training or recreational purposes. Despite its enticing atmosphere and variety of courses, Scratch Lab hasn't convinced the entire DJ community of its goals. Jameel Brown, 26, better known as DJ XL has been one the Toronto mix tape and club scene for the last nine years. He says to some extent it is possible to learn how to DJ in a school setting , but adds for the school to churn out good DJs may be a difficult feat. "Some people you could be teaching them for hours and they'll never get it, so it really depends on that person's drive...," Brown explains. "Fine tuning your music takes a lot of years of training with your listening skills." Tobias agrees in part with Brown; however he still stands by the school's value. "It's as anything else; you could go out and take basketball lessons from LeBron James...but if you're just not athletic, you're not going to be a great basketball player. Having said that, you could be that non-athletic person and become a better basketball player," he says, adding, "I would challenge anybody to come in and take a class who thinks differently." Students Shiv WIlloughby a.k.a. DJ Xplisit and Earl Curtis Jr. a.k.a. Ghoat have taken that challenge. Enrolled in Beginners One, the two college students have completed one semester at Scratch Lab with no complaints. "I like the fact that it's comprehensive," says Willoughby after his eighth class. "Everything we've worked up to at this point, it's been small in progression, but it's leading up to something big." While Curtis says he's learning how to DJ as a hobby, Willoughby, perhaps like several other students, has high hopes. "I don't necessarily want to be the huge guy in the spotlight," he says. "[But] I definately want to go far with it, I want to be in the clubs and I want to be in the clubs and I want to be on the radio like [Starting From] Scratch." "The turntable is the new guitar,” says Baba Kahn, “and DJs are the new rock star.” Kahn is the co-owner of Scratch Lab — Canada’s first DJ institute geared towards students of all ages and abilities. Kahn and business partners Jordan Fisher and Abby Tobias opened the school’s doors this past January and have about 160 students. “DJs will have the crowd in the palms of their hands but there’s not enough credit put towards them” Kahn continues. For the working DJ, reaching the right climax isn’t as easy as popping a pill or braving it at the baths. So Scratch Lab and its six instructors teach students the business and artistry behind the music they love. Michael “Deko-Ze” Babb began spinning sweetly at sixteen. Since then, with a world of support from Wade Allan — his partner of 14 years who he describes as “my rock, foundation, my direction” — he’s charmed his fair share of heteros and homos alike from Toronto to Taiwan. Scratch Lab’s main studio is meticulously outfitted. Each student’s station has a pair of turntables, a pro DJ mixer, and headphones. Overlooking them is a graffitied take on the Toronto skyline, and a projection screen above the master table. “I’ve got to say the facility is pretty spot on,” says Deko-Ze with a slow nod and a 1000-watt smile. Kahn, who can boast musical ties to Jazzy Jeff, starts with a simple beat, then explains the importance of lowering your body to the level of your ‘opponent’ (the turntable) to retain control and lightness of touch when scratching. “One finger does the trick,” he insists. Next, he has Deko-Ze repeat the proper placement of a scratch. “Imagine him telling me that I’ve got to flick my wrist back,” laughs the out-and-proud Deko-Ze. One of the best things about writing for happygrrls is that I get to meet really interesting people. If I want to know more about someone or something, I contact them and I do an interview. This is the case with the Scratch Lab DJ Institute. I heard about a new school that taught inspiring DJs about the art and science of DJing called Scratch Lab, but that’s all I knew. I Googled Scratch Lab and found some information that piqued my interest, and came to the conclusion that I loved the concept and I really wanted to talk to someone. I e-mailed the school and got the friendliest e-mail from Jordan Fisher, the Director of Marketing and Sponsorship. I told him that I was curious about the school and he invited me to come down to see it for myself. I gladly accepted. I visited the school on probably one of the coldest days of the year, but I was given the warmest welcome from Jordan. Once I warmed up from leaving the blistery cold weather, he took me around and gave me a tour of the very professional looking school. I’m sure that I scared him with all my ooohhing and aahhhing! The main classroom is spacious, with ample room to house the many turntable workstations that are set up. The instructor stands on an elevated platform while a projector screen behind him catches all of his moves. This allows the students to see everything that he is doing. Very impressive! The school also boasts two practice rooms for those who want to get in some extra study time. Before I conducted the interview, I was given the opportunity to sit in on the Beginner’s class that was instructed by DJ Grouch and Dave Campbell. Unfortunately, I didn’t get my hands on the turntables, but I quietly watched from the sidelines. I enjoyed the way they taught. Their teaching style was laid back, but they balanced it by being very hands-on and thorough. I liked how they used humour along with their DJ expertise to motivate their students. After observing the class for close to an hour and being completely taken with what I witnessed, I felt ready to sit down with Jordan and learn more about his very lucrative business. How did the concept of the Scratch Lab come about? My partners and I had the idea a few years ago and we thought that there was a need for people who didn’t have hours and hours on end to try and figure out how to DJ. I actually don’t DJ myself – my partners do. We looked around to see if the idea existed anywhere, and it didn’t in Canada. DJ Baba Kahn and Abby Tobias. Baba is one of the top club DJs in the city and Abby owns a mobile DJ company. He DJs at weddings and parties. How were the DJs selected? We all envisioned getting the best guys to be a part of the school. We know that not all good DJs necessarily make good teachers. We want guys that are approachable, knowledgeable, willing to chat with students; basically we want them to check their egos at the door. Who are the Scratch Lab DJs? Baba Kahn, Starting from Scratch, DJ Grouch, Dave Campbell and Jr. Flo. Students can do private classes or group classes. The group classes run on a semester basis. A semester is ten classes, once a week, and they run for 70 minutes. We provide all of the equipment and the records. We also give all the students free time in the private practice studio, so that if they don’t have their own equipment, we encourage them to come and use our facilities to practice what they’ve learned in class. It is just like any other instrument, you gotta practice if you want to excel. We have Beginner, Intermediate and Advanced classes. Each of those levels consists of two semesters. In the Beginner classes you are taught all the fundamentals of Djing – equipment knowledge, set up, tear down, beat matching, blending, mixing, basic scratching. The Intermediate deals with the business aspect of things and getting into the digital side as well. I wouldn’t recommend taking the Intermediate for someone looking to do this as a hobby. It’s really geared to those who have the fundamentals down and are interested in DJing professionally. The Advanced class is for DJs that are already working in the field and want to expand their skills. Do you only use vinyl? All vinyl. We teach everything on vinyl. Students in the Intermediate program use the program Serato, which allows you to hook up your computer to your turntable and utilize MP3s. It comes with time-coded vinyl, so you still need to have the skills to be a DJ, but the vinyl that comes with the program allows you to pickup the sounds from the computer. Did you assign specific DJs to certain classes? When we were coming up with the curriculum, it was a joint effort in a sense that we sat down and figured out what we were going to accomplish, and getting the right guys that specialize in one thing, and getting their input. DJ Grouch and Jr. Flo are turntablists, so they are able to oversee the Advanced classes. Since January we’ve had 250 students. Are all the students around the same age? No, our youngest is 10 and our oldest is 51. We have a kid’s class for kids 13 and younger. Our demographics are so varied. Being in Toronto, there are so many people with their own background and ethnicities that they bring their own flavour to DJing. More and more women are coming to the school, which is great. There is such a great market for female DJs. You know guys, we’re not hard to figure out! Get a good female DJ, and guys will run! How has the school changed since you opened it? For one thing, more people are becoming aware of us. Also, we recently had our curriculum approved by the Ontario Ministry of Education. So now it’s in line with the requirements for a grade 10 half music credit. So kids can come here – and once they’ve completed 60 hours of course material, which is going through the program from Beginner to Advanced – they are able to go into high school and receive credit. What do you want your students to accomplish at the end of their semester? I want them to learn, expand their minds. Come in and leave knowing more than when they came in. Whether it’s expanding their musical tastes or learning how to beat match. Everyone is different. I want them to leave with the skills that they’re taught, and I want them to learn more and take what they’ve learned and go out on their own. Would you like to open the Scratch lab in other cities? Eventually, but not yet. It’s pretty amazing, just by advertising online we’ve gotten franchise inquires from everywhere from Singapore to India. There’s definitely potential, but you need a solid foundation before you branch out. Anything next for the Scratch Lab? We are doing a summer camp this summer. We are going to run one-week programs for kids 10-13 years old and a program for kids 14 years old and older. I know that you are “The Business Man,” but have you ever tried to DJ? Canada ’s First Exclusive DJ School, Scratch Lab DJ Institute Inc., opened in Toronto January 2006. Canada’s first and premiere facility for the training of DJs and other music related trades. Scratch Lab DJ Institute is a one of a kind facility that offers both group and individual learning opportunities in a 2500 square foot studio complex at 1170 Sheppard Avenue West. With a combination of state of the art equipment sponsored by Numark, and world class instructors, Scratch Lab is a revolutionary concept in the world of music education. Since opening, Scratch Lab has also been able to have their custom curriculum meet the Ontario Ministry of Education standards, enabling a Grade 10 music credit, called “Music and the DJ” to be offered. Classes are taught with a non-genre specific mindset. Scratch Lab DJ Institute was designed to help gain recognition and musical acceptance of the instrument known as the turntable. With no strings or keys, and no recognized charting, the turntable doesn’t receive the same “instrument” title that a set of drums or horn would. At Scratch Lab, students learn the art and the many complexities of the turntable, and how it can be used as their musical instrument. In the 21st century, turntables and the DJ have worked their way into mainstream music and are admired by many across the globe. With that in mind, Scratch Lab hopes to help the DJ community grow through education, advertisement, innovation, and skill. The Facility is built to accommodate twelve students at one time in our group studio, with an additional two private studios for one-on-one training or practice. Classes are offered during the week in the afternoons and evenings. On weekends, daytime classes are also available. Classes are offered at all skill levels and in both professional and hobby related styles. Scratch Lab students range from young children to adults of all ages. All students work from a custom made curriculum that includes a workbook, and Scratch Lab record. This curriculum was designed specifically as an educational tool for learning the skills necessary to DJ at various skill levels. Scratch Lab is proud to work with the most talented DJs from across the Greater Toronto Area. Jordan is the marketing brain behind Scratch Lab. Having graduated from one of Canada's top marketing programs at York University in Toronto, Canada, Jordan has worked in the Marketing field, specifically in the entertainment and live-event divisions at various Advertising and Marketing Agencies, including OMD and Echo Advertising. Having developed campaigns for Alliance Atlantis Entertainment and Clear Channel Entertainment (Live Nation), Jordan is well versed in the world of Marketing and Promotions. Jordan brings a combination of entrepreneurial spirit, a passion for music and personal growth to the Scratch Lab team. Scratch Lab DJ Institute Inc. The Argos Cheerleaders have been practicing diligently for the past few weeks, and it is hard to believe the football season is just around the corner. With all of our attention focused on perfecting all of our new dances, our head coach Jorie Brown thought it would be nice for us to take some time to let loose and bond as a team. What better way than a DJ training session at Scratch Lab! This is one of the most unique outings I have ever experienced and I definitely have a greater appreciation for turntable DJs. We all met up in our new classroom which is set up like a regular classroom but instead of desks we all had our own turntables. Our teacher, professional DJ Craig Brooklyn, was on an elevated platform with his turntables projected onto a big screen behind him, so we could see what he was doing. The Scratch Lab has an amazing record selection and we all got to pick any two records we wanted to spin. We learned how to scratch a record, rewind it and drop a beat! I thought that my coordination with dancing would help me and translate easily to spinning records since DJ Craig counted similarly to the way we count in dancing. There is definitely a finesse and unreal hand-eye coordination that goes into being a turntable DJ that I don't have! However, we did get some one-on-one time with DJ Craig, and we all managed to get some fairly good sounds out. There may have been more random sounds coming out our turntables instead of actual music mixes, but it was a great time to get to laugh and listen to some great music with my teammates. Maybe with a few more lessons you will hear an original song done by your Argos Cheerleaders! The football season has only just begun, but we are already building lifetime memories. I can't wait until the next team outing! A big thank you goes out to Solepower Productions and Scratch Lab. 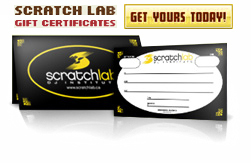 Scratch Lab is Canada's premier facility for DJ training and other music-related trades. New classes for students of all ages and skill levels willl begin in May, followed by the Summer and Fall semesters . Check out www.scratchlab.ca for more details.